Cascading shapes and curves of red sandstone reflected by natural light reflect a beautiful scenic landscape unique to the Antelope slot canyons of the Colorado Plateau in Navajo Land near Page, Arizona. Carved through iron rich Navajo Sandstone, Antelope Canyon is one the many slot canyons of the Colorado Plateau sculpted by flash floods during the monsoon season of late summer. Though these slot canyons are carved into many different geological layers of sandstone and limestone, it is the Navajo Sandstone, formed from the petrified sand dunes of a large Jurassic desert similar to the Sahara Desert of today, that often become the richest canvas for the flash floods to carve their masterpieces through. These canyons become otherworldly sculptures of stone that slowly evolve over time. This image belongs to the travel and nature stock photo library. This stock photo of Eye Of The Antelope is available for licensing for commercial and editorial uses including websites, blogs, books, magazines, brochures and advertising. Restrictions may apply for images which contain third party copyrighted material or sensitive subjects. Photos of artwork are for editorial use only. 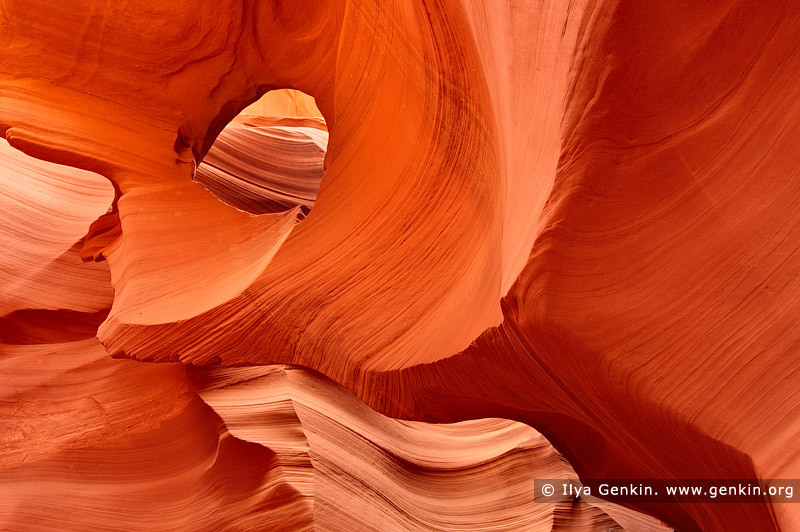 This image id US-ARIZONA-ANTELOPE-CANYON-0002 of Eye Of The Antelope, is copyrighted © by Ilya Genkin. This is not a public domain image.